Ideally located on the waterfront in the heart of Singapore’s vibrant heritage district, this luxurious modern hotel pays more than a passing nod to the city’s traditional roots. Indeed, between its elegant rooms and fine-dining restaurants, its sense of refinement is seriously in tune with Singapore’s colonial past. 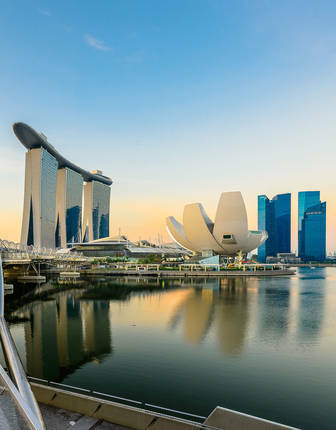 Rooms and suites are decked out in muted browns and creams, their sophisticated dark-wood furnishings contrasting with the city’s skyline and, in some cases, the deep blue of Marina Bay. Premier Bay Rooms are a special highlight, with their en-suite Jacuzzis, while the lavishly appointed Theme Suites are a throw-back to the glamour of the early 20th century and add in the likes of exclusive balconies and floor-to-ceiling windows. The dining experiences here are just as special, with four restaurants serving up a globe-spanning array of culinary delights. There’s La Brasserie with its menu of French bistro favourites, the Clifford Pier, where guests can sample everything from Singaporean classics – think succulent wagyu beef and spicy prawn laksa – to an indulgent afternoon tea – one of the best in the city. And, there are two bars – Lantern for after-hours drinks and The Landing Point for a tempting range of artisanal cocktails accompanied by the twinkling ivories of the resident pianist. And that’s not all. There’s a fully equipped gym – perfect for working off those calories – and a fabulous rooftop pool flanked by two glass-framed Jacuzzis. What’s more, the nearby Fullerton Hotel – the Bay’s sister property – offers guests full use of its superb spa. Celebrate one of the world’s great cities on this indulgent weeklong break, complete with private tours and transfers, and stays in two luxurious hotels.